Welcome to the Chicago Architecture Center (CAC). We hope you enjoy your visit! It pays to be a CAC member! Members get free admission to the CAC year-round, as well as free access to 65 walking tours, a buy-one-get-one free river cruise benefit and much more. From the Kennedy (I-90) and Edens (I-94) expressways, exit at Washington Street (past the Ohio Street exit). Turn left (east) on Washington Street to Michigan Avenue. Turn left (north) on Michigan Avenue and proceed to E. South Water St. Turn right (east) on E. South Water St. and the parking garage entrance is the first driveway east of Michigan Ave., on the north side of E. South Water St. (address is 233 N. Michigan Ave.). From the Eisenhower Expressway (I-290), continue eastbound into the city (the Eisenhower turns into Congress) to Michigan Avenue. Turn left (north) at Michigan Avenue. Left turns are not permitted at Michigan Avenue, so cross over Michigan to the turning circle, bearing left and double back to Michigan Avenue, now turning right to head north. 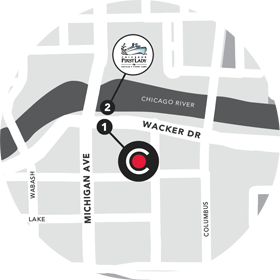 Continue north on Michigan Avenue until you reach E. South Water St. just south of the river and proceed as above. From Lakeshore Drive, take the north or south exit at Wacker Drive and continue westbound. Turn left (south) on Michigan Ave., then take the first left on E. South Water St. The parking garage entrance is the first driveway east of Michigan Ave., on the north side of E. South Water Street. The closest CTA train transit stations are State & Lake (Brown, Green, Orange & Purple Lines), Lake (Red Line) and Clark & Lake or Washington (Blue Line). In each case, after exiting the station, walk east to Michigan Avenue, cross over to the east side, then walk north toward the river/Michigan Avenue Bridge. Do not cross the bridge. When you reach Wacker Drive, turn right (east) and the CAC will be the second building on your right. Visit the CTA's website for routes and schedules at transitchicago.com. The closest parking garage is located at 233 N. Michigan Ave. The entrance to the parking garage is the first driveway east of Michigan Avenue, on the north side of E. South Water Street. CAC members receive a discount on parking at this garage. Several other public parking garages are available in the River North and Loop neighborhoods. SpotHero can help you find a good deal. Plan a private or custom tour experience for a group of up to six people. Do you have further questions about the CAC? Read our frequently asked questions.